The Broxson Award was created to recognize the individual on the Wright-Patterson Medical Center staff who most significantly touched the lives of families residing at the Fisher and Nightingale Houses with compassion and support. The award is named after Dr. Emmet Broxson, Director of the Pediatrics Specialty Clinic, Wright-Patterson AFB Medical Center from 1988 to 1996 and was established by the founder of the Nightingale House, Capt. Gretchen Lizza. The Broxson Award is the most prestigious recognition given by the Houses in honor of the families we serve. Our families vote and choose the recipient each year. The award is meant to distinguish that medical servant who, like Dr. Broxson, epitomizes virtue and strength. Dr. Emmet Broxson’s dedication and gentle ways endeared him to the families whose children he treated during his service in the U. S. Air Force. Diagnosis and care of children who battle catastrophic diseases – diseases without cure – is by far the most difficult area of medicine. Physicians and their staff who attend to these children tirelessly search for answers. Dr. Broxson distinguished himself through his consummate love of children and daily demonstration of a faith in wisdom that transcends understanding. This is why the award is named for Dr. Broxson. 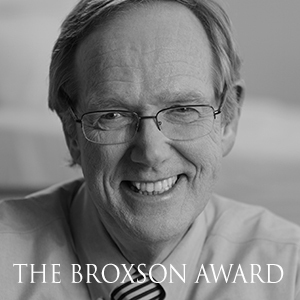 The Broxson Award celebrates the humility and strength of Dr. Broxson. The award was first presented to him and now identifies others who exhibit dedication to their practice and compassion for others. » Read about the 2017 recipient here. » Read about the 2016 recipient here. » Read about the 2015 recipients here.